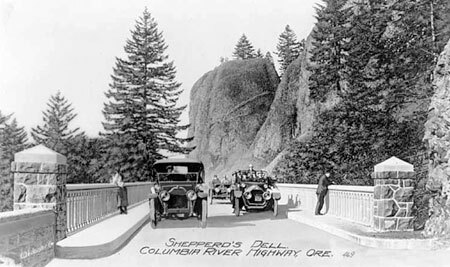 George Shepperd’s place in our history comes from his generous donation of Shepperd’s Dell to the public in 1915, as the historic Columbia River Highway was nearing completion. After posting the story of George Shepperd recently in “The Farmer and his Dell” , his great-great granddaughter Rosemary (Shepperd) Guttridge contacted me with a few updates to the article and some wonderful photographs. 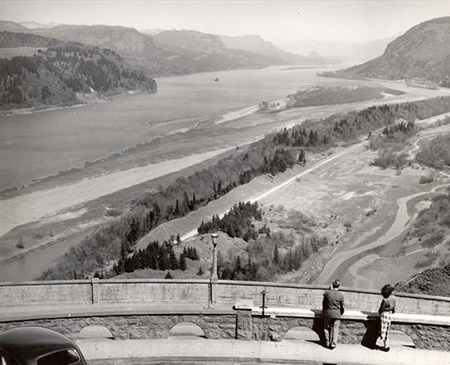 This follow-up article includes several of her Shepperd family photographs and a brief interview with Rosemary Guttridge — and a proposal for finally honoring George Shepperd at his namesake dell in the Columbia River Gorge. The first of the family photos provided by Rosemary Guttridge (above) shows a very young George Shepperd with his first wife, Matilda. This undated photo is likely from the 1870s, when Shepperd was still in his mid-20s and before the couple moved their young family to Iowa. They would farm for a decade on the open prairie before finally heading west to Oregon. 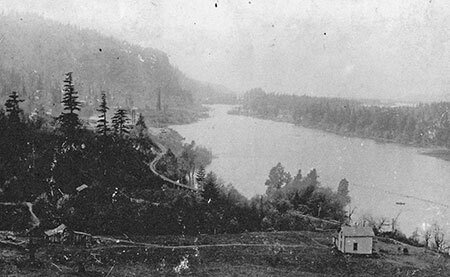 This is a rough guess of the location based on images of the farm showing Crown Point in the distance, a flooded Columbia River and the first rail line to be constructed on the Oregon side of the Gorge. 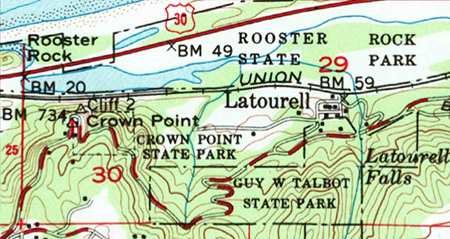 The cluster of buildings shown to the east on this map are part of the mill town of Bridal Veil, and located on the site of today’s Bridal Veil State Park. 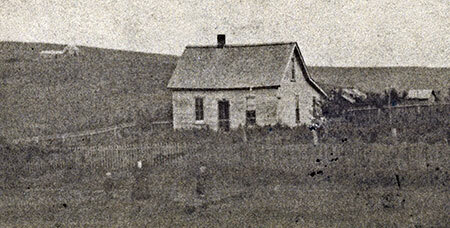 The above image shows the area around the house to be a bit barren, and the Shepperd family history dates this photo to 1898, roughly nine years after George and Matilda Shepperd claimed the land. For a larger view of the farm photo (including Crown Point on the horizon) click here. The most stunning and fascinating of the images shared by Rosemary Guttridge is the following family portrait, taken in approximately 1895, based on the ages of the family members. The photo tells a story of change in the family, as it was taken in the period after George and Matilda Shepperd had divorced in 1895, but before George had remarried to Mattie Williams in January 1896. The family portrait provides our first good look at George Shepperd, 46 years old in this photo, and also a man to his right who seems to be his older brother by three years, Matthew Shepperd. 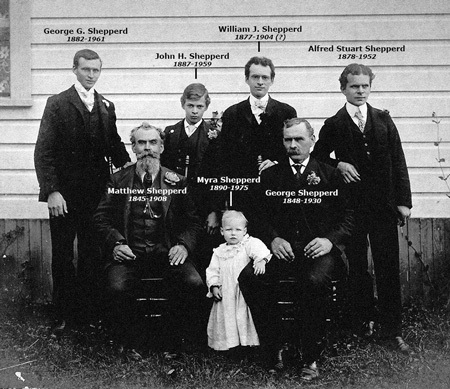 Matthew shows up as living at the Shepperd farm in the 1900 census, so one possibility is that he arrived to help George with the farm and raising his children after George and Matilda divorced. Despite this challenging start, Myra went on to marry Robert Earley when she was 18 (in 1908), and they had two children of their own. Myra lived until 1975, when she died at the age of 85. 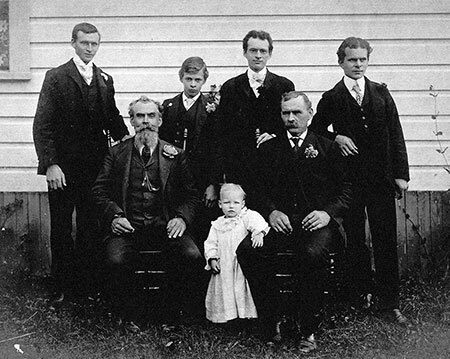 The identity of the three older sons in the family photo is somewhat confusing, but Rosemary Guttridge is certain that her grandfather, George G. Shepperd, is standing on the far left (tallest of the three boys). Though he looks older than his years in this photo, he would have been just thirteen. 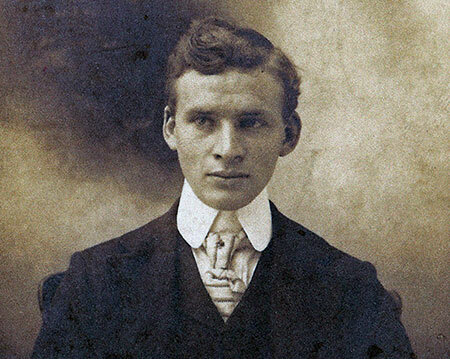 Rosemary Guttridge shared another portrait of her grandfather, George G. Shepperd, taken in 1902 (below) when he was 20 years old. 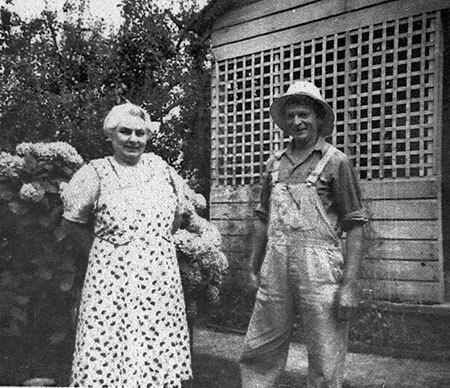 George G. would marry Emma Fick in 1914, and the couple moved to the Shepperd farm in 1920, after his father had retired to Portland. 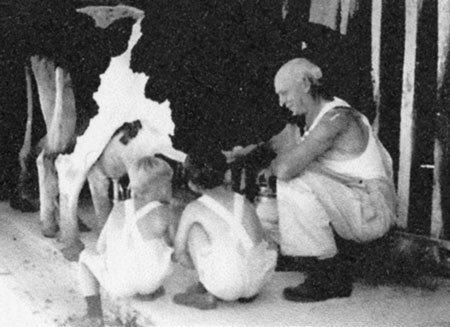 George and Emma farmed and raised dairy cattle on the farm until 1953 or 1954. George G. Shepperd’s son (and Rosemary Guttridge’s father) was George Shepperd Jr. (known simply as “Junior” in the Shepperd Family). 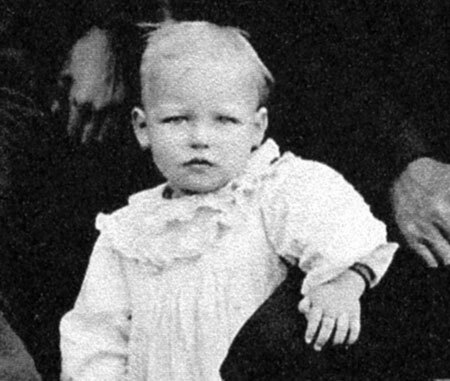 He spent much of his childhood at the Shepperd farm in the 1920s and 30s, and married Suzanne Curtis in 1940. 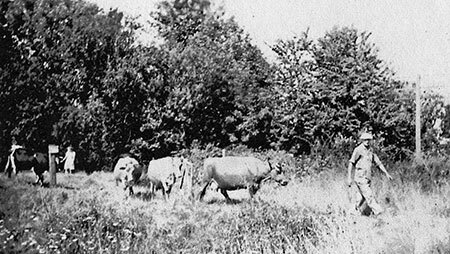 Their very young children George Scott and Rosemary visited the family farm before their grandparents moved to Portland in the early 1950s. George Junior died in 1975 but his wife Suzanne has survived him by nearly four decades, and is still living today in the Gresham area at age 97. 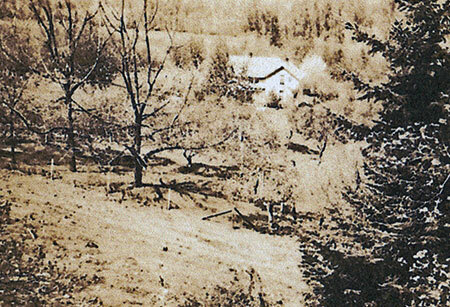 Rosemary Guttridge shared another photo (above) of the Shepperd farm that is dated 1898, but seems to be taken much later than the earlier photo (at the top of the article), judging by the size of the established trees in this photo. Assuming the first photo was taken in the 1890s, this photo is likely to be from sometime in the early 1900s. WyEast Blog: Rosemary, thanks for answering a few questions about your family — the Shepperds of beautiful Shepperd’s Dell! George Shepperd was your great-grandfather, but I don’t think he was alive when you were born, is that right? He died in 1930 when my dad would have been 15 years old. WyEast Blog: So, your grandfather is George G. Shepperd, the third son of George Shepperd — and your father is George Shepperd, Jr., is that right? From the family history you shared with me, there are George Shepperds in the family line that date back to England in the 1700s – that’s a lot of George Shepperds to keep straight! There are certainly many Georges in the family tree and unfortunately they didn’t seem to use middle names often so it is a bit hard to keep them straight. The first recorded George Shepperd (in our family Bible) was born sometime in the late 1780s and his son was James, who was my great-grandfather’s father. Now we’re back to Georges! Great-grandfather George was born in 1848, his son, my grandfather George G., was born in 1881 and his son, my father George (known as Junior in school), was born in 1915. Wouldn’t want to stop there!! My brother, George Scott is one more. And I realized my mother’s grandfather is George. Then after my father passed away, my mother married… yep, another George!! I think the family is done with that name for now! 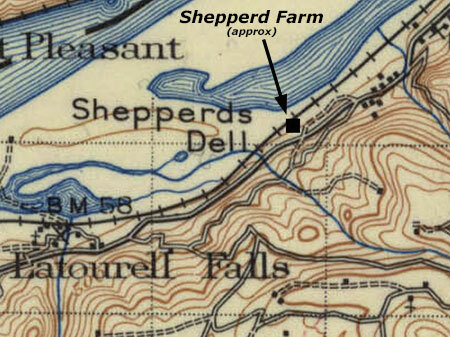 WyEast Blog: Your grandparents lived on the family farm at Shepperd’s Dell until sometime in the 1950s. Do you have memories of them from the farm? My only memory was when I was probably 3 or 4 years old trying to feed the cows some grass. I reached through the barbed wire fence with handful of grass and caught my arm. The scar is still quite visible. I don’t remember anything about the inside of the farmhouse, the barns or the views. My brother says he remembers staying overnight at the farm and he had to sleep upstairs with no heat or lights and it was “scary”. My grandmother mentioned more than once the hobos who would come [to the house] for a meal. She said [the family] had left some kind of mark on the gate, which meant they could stop. 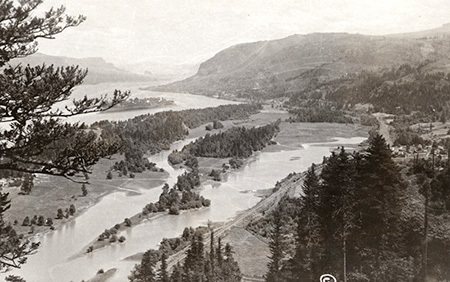 WyEast Blog: You also sent a wonderful photo of the Shepperd land claim, with the Columbia River and Crown Point as the backdrop – what a beautiful place to have a farm! 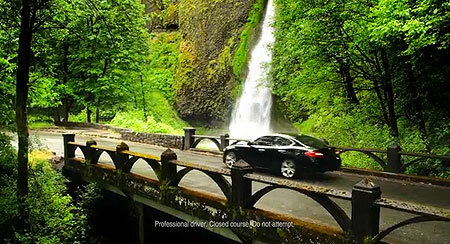 But it must have been a hard life living through the harsh winters the Gorge is known for — is that something that has been passed down in your family history? My grandfather was a dairy farmer, which must have been so very tough in the winters. Not sure how they even got the milk to town. My father left the farm after some college and became a banker. Not sure he thought diary farming was much fun! WyEast Blog: The photo of the Shepperd farm shows at least three buildings – a farmhouse and at least two barns. Is this the same farmhouse that your grandparents later lived in? Does it survive today? There is nothing left of the old farmhouse or barn. Now, in its place is a rambling one-story house. I’m not even sure what happened to the place after Grandpa and Grandma moved to Portland in 1953 or 1954. Hopefully some other relatives can read this and help out with what they know. 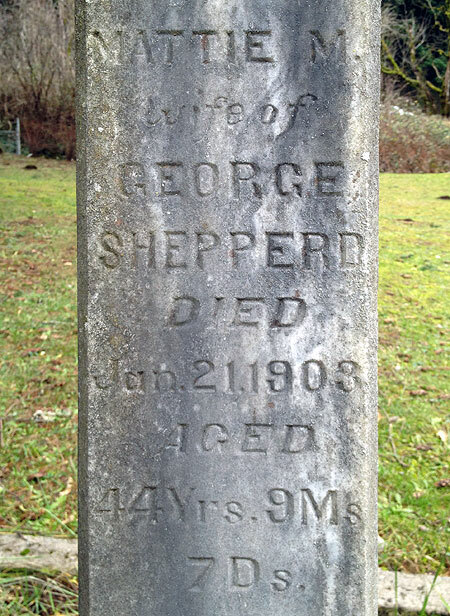 WyEast Blog: George Shepperd’s second wife, Mattie, died in 1903, just a few years after they were married and was buried at the Bridal Veil Cemetery. George placed a remarkable grave marker there — is there any family history about their short marriage? George was clearly heartbroken by her death, based on the inscriptions on her memorial. Wish I knew something about this. And again, perhaps some relatives will surface and help! WyEast Blog: You’ve undoubtedly visited Shepperd’s Dell many times in your life, and that must be an amazing feeling, to know that your great-grandfather made that park possible. 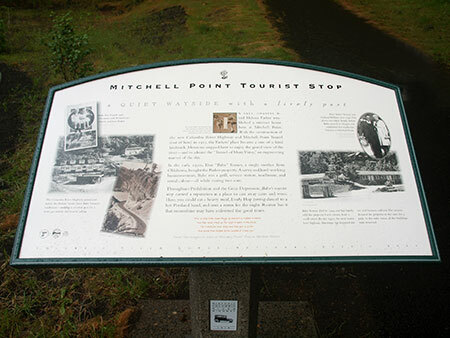 Do you still visit Shepperd’s Dell, and what is it like for you to see the sign with your family name on it? WyEast Blog: Thanks for your help in piecing together a bit more of George Shepperd’s story, Rosemary – very much appreciated! Any other thoughts you’d like to share for this interview? Again, I hope some of the relatives will read this and contact you with more information. I think some of them live in the Portland area. Wouldn’t it be great to get more pictures and to clear up so many of the questions! WyEast Blog: Well, I will certainly let you know if I do hear from other relatives, Rosemary! 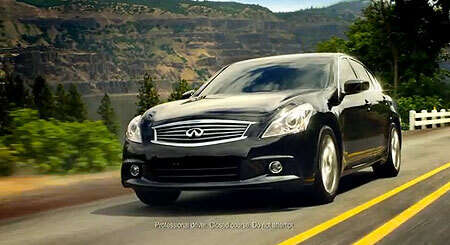 Thanks, again, for tending to your family history, and especially the legacy of your great-grandfather. Special thanks go out to Rosemary (Shepperd) Guttridge for sharing so much of her family history. Rosemary has also given me permission to post a companion Wikipedia article on George Shepperd, including some of the family photos. I’ll post an update on this blog when the Wikipedia page is complete. 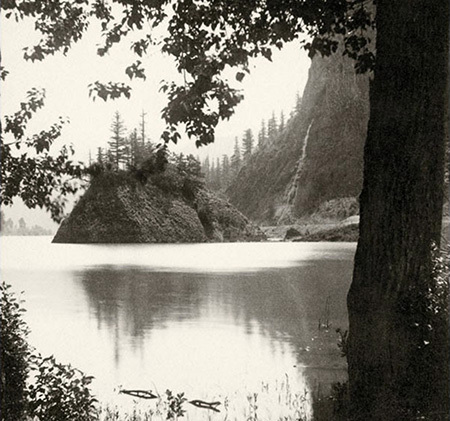 The story of George Shepperd is inspiring on so many levels, and yet has been nearly forgotten in our written history of the Columbia River Gorge. His story deserves to be told to all who visit his Dell, and who might wonder about the mysterious name on the bronze plaque at the east end of the Shepperd’s Dell bridge. Perhaps the most compelling reason to tell George Shepperd’s story is that he was one of us: a man of modest means who faced real hardships and tragedy in his life. 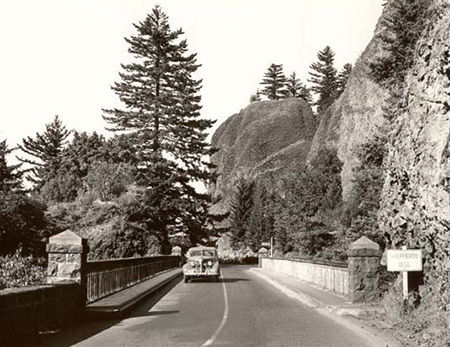 He was different from the well-known timber barons and political icons whose names are engraved on monuments throughout the Columbia River Gorge. This distinction is important, as it inspires all of us to rise above our own everyday struggles, and strive for lasting contributions that will define us after we’re gone. 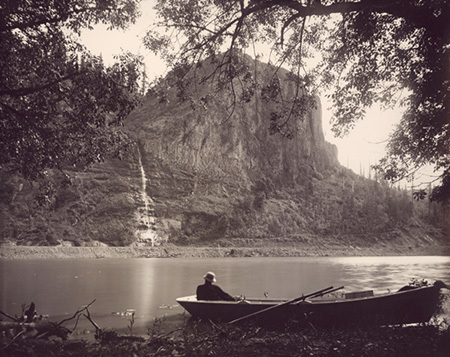 In this spirit, we should seize upon an opportunity in the form of a new Oregon State Parks plan for the Gorge that calls for renovating the Shepperd’s Dell wayside. The time is perfect to do justice to the memory of George Shepperd. The second memorial should be to George Shepperd, the man. This memorial has already been written: when he died at the age of 82 in July 1930, the Oregon Journal printed a poignant tribute that still serves as a most eloquent salute to George Shepperd. 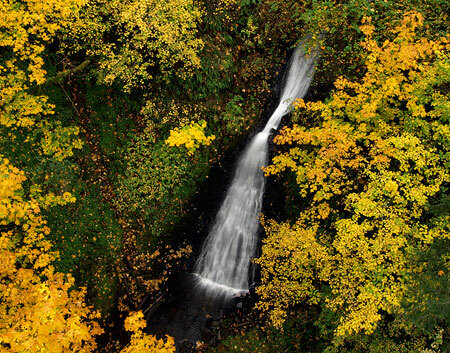 You can learn more and comment on the Oregon State Parks early plans for Shepperd’s Dell (and other state parks in the Gorge) on their Gorge Parks Plan website. While you’re there, consider putting in a good word for the legacy and memory of George Shepperd – as his fortunate heirs, it’s the least we can do! 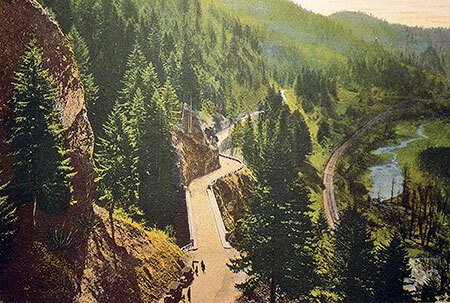 For nearly a century, countless travelers on the Historic Columbia River Highway have admired the idyllic scene that unfolds at Shepperd’s Dell, one that has also appeared on dozens of postcards and calendars over the decades. Yet, beyond the fanciful name and a small bronze plaque at the east end of the highway bridge, few know the story behind the man who gave this land to the public to be enjoyed in perpetuity. Who was George Shepperd? This article is about the modest farmer who gave us his “dell”. 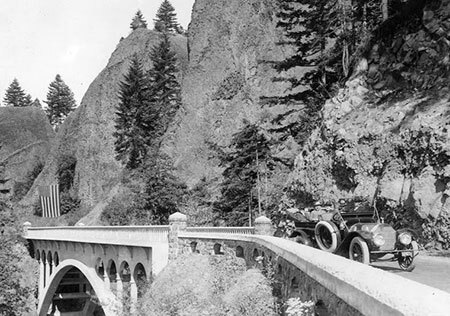 George Shepperd’s story is interwoven with the brilliant vision of a true icon in our regional history, Samuel Lancaster, the chief engineer and designer of the Historic Columbia River Highway. 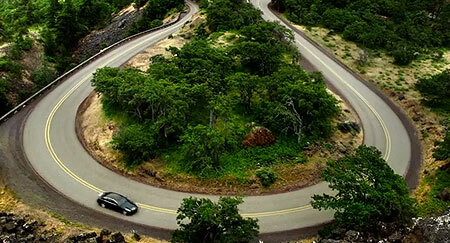 Had Sam Lancaster not attempted to frame sweeping views and hidden natural features at every turn with his epic road design, Shepperd’s Dell might have remained a mostly hidden secret. With this grand vision, Lancaster saw a special opportunity to showcase nature at Shepperd’s Dell. 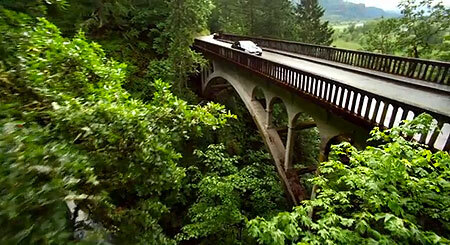 When approaching from Crown Point, the old highway rounds a blind corner cut into sheer cliffs, high above the Columbia when the graceful, arched bridge spanning Shepperd’s Dell suddenly comes into view. 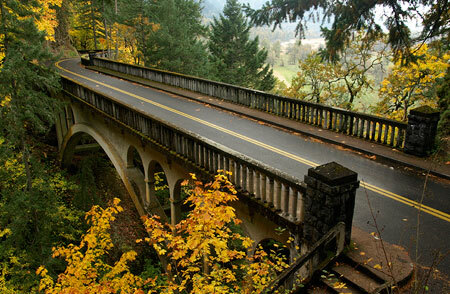 Tall basalt domes rise above the bridge, and from mid-span, visitors are treated with a view into the shady, fern-draped “dell” holding Young Creek. 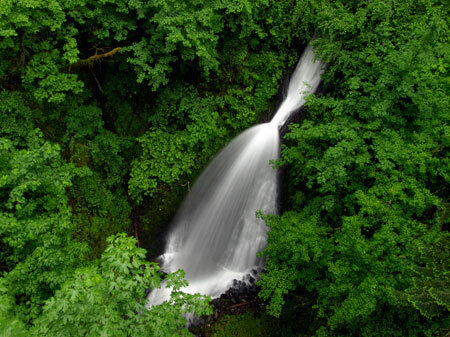 A graceful, 8-tiered waterfall leaps a total of 220 feet through a twisting gorge, much of it hidden from view in the mossy recesses of the dell. 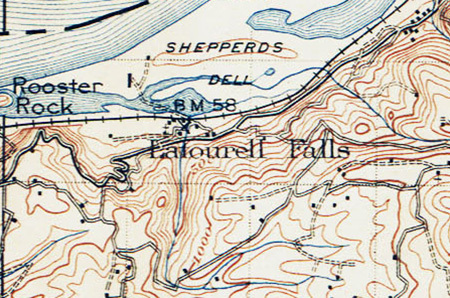 In his inspired design for Shepperd’s Dell, Sam Lancaster’s threaded the needle by spanning the narrow canyon at the midpoint of the falls. By any other highway engineer of the time, this would have been a travesty, but Lancaster’s gracefully arched bridge and careful attention to detail achieves the opposite: he transformed this little grotto into one of those rare examples where man and nature meld in idyllic harmony. This artful balance is the enduring lure of Shepperd’s Dell to this day, making it a favorite stop along the old highway. 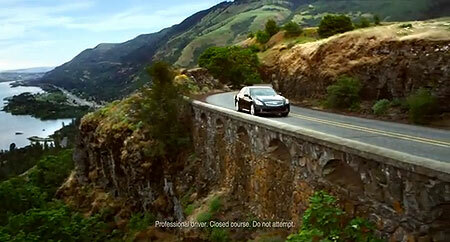 Complementing the highway is a rustic footpath leading from the bridge to a viewpoint at the edge of the falls. The footpath is cut into the vertical walls of the dell and framed with Lancaster’s signature arched walls. 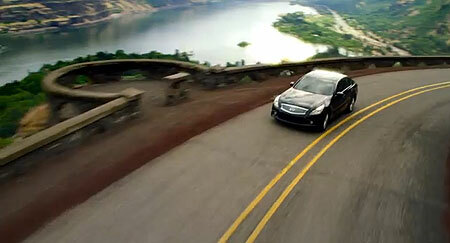 From the falls viewpoint, the vista sweeps from a close-up of the cascades on Young Creek to the graceful arch of the highway bridge, soaring above the canyon. 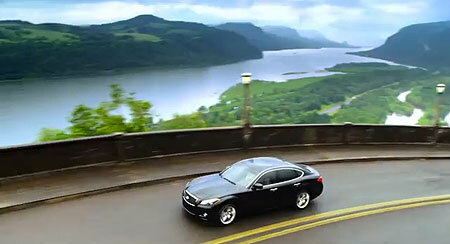 This is understandably among the most treasured scenes in the Columbia Gorge. 1920s postcard view of Shepperd’s Dell showing the Bishop’s Cap in the distance. 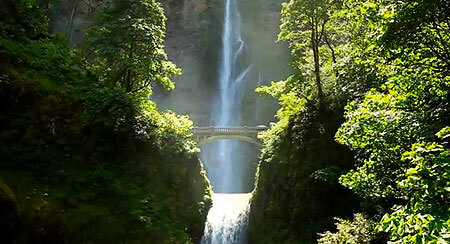 Samuel Lancaster created this scene as we experience it today, but only because George Shepperd made it possible by showing Lancaster his secret waterfall, and offering to donate his land to the highway project so that others might enjoy his dell in perpetuity. George Shepperd, his wife Matilda and their sons William and Stuart moved from Goderich Township, Ontario (roughly halfway between Toronto and Detroit) to a farm in Audobon County, Iowa in 1880, where the couple gave birth to two more sons, George Jr. and John. 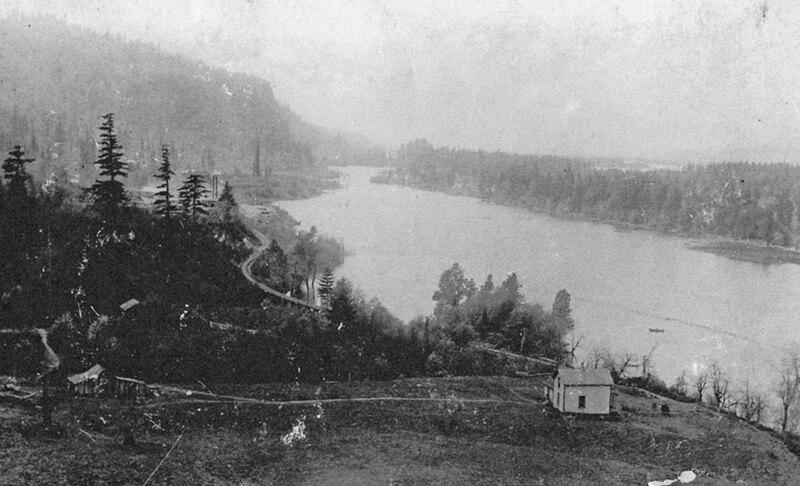 In 1889, the Shepperds moved again, this time to Oregon where they settled in the Columbia River Gorge on a 160-acre land claim along Young Creek, just west of the mill town of Bridal Veil. Their fifth child, a daughter named Myra, was born just a year after they arrived, in November 1890. Upon settling in Oregon, George Shepperd supported his family by farming, dairying and working at the nearby Bridal Veil Lumber Mill. 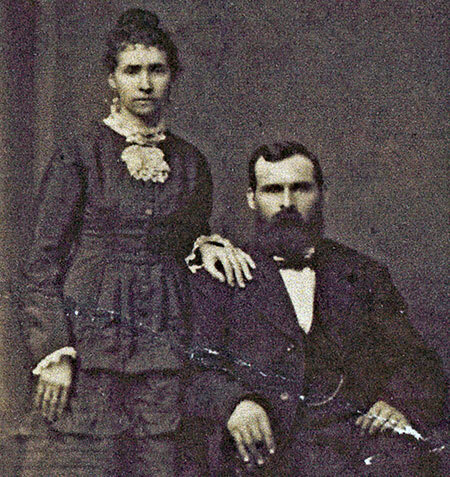 At this point in history, the George Shepperd story becomes complicated: in May 1895, George and Matilda divorced, and in January 1896, George married Martha “Mattie” Maria Cody Williams, who had also recently divorced. 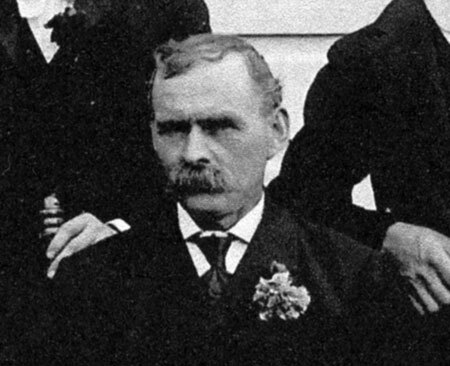 Mattie apparently met George when the Shepperd and Williams families had traveled west to Oregon together in 1889. The “Cody” in Mattie’s lineage was indeed William F. “Buffalo Bill” Cody, a first cousin. The view today from Shepperd’s Dell toward Crown Point includes some of George Shepperd’s former pasture lands, now in public ownership and managed for wildlife. George Shepperd was 47 years old when he married 37 year-old Mattie in 1896, and while the first years of their new marriage seemed to have been blissful, the next 35 years of his life were a rollercoaster of tragedies and triumphs. 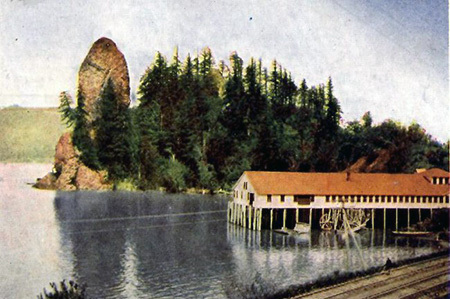 The tragedy began in 1901 when his eldest son, William J. Shepperd, boarded a train to Portland to pick up supplies for the business he and his brother George Jr. had in Hood River. 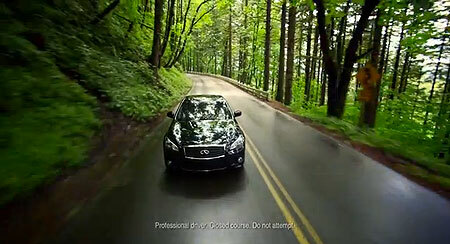 William reportedly waved to friends and family from the rear platform as he passed through Bridal Veil and the Shepperd farm, then was never seen again. Local news accounts speculated that William had been “Shanghied” while in Portland and taken aboard a foreign cargo ship. 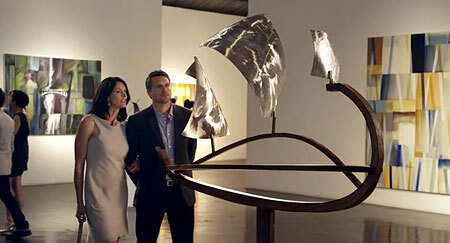 Ten years later, William’s surviving wife Osie and son Raymond also disappeared after living with the Shepperds and members of Osie’s family in Portland for several years. They were never heard from again by George Shepperd. 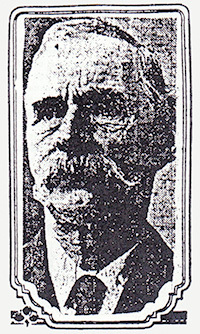 More tragedy ensued in 1903, when George Shepperd lost his beloved Mattie, just seven years after the two had married. There is no record of why she died, though some accounts describe her as “crippled” in those years. She was only 44 years old. 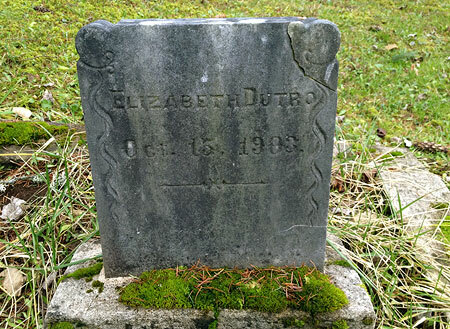 The infant grave of Elizabeth Dutro is also located within the otherwise empty Shepperd family plot, next to Mattie’s grave and dated October 15, 1903 – seven months after Mattie was buried. Baby Dutro seems to be Mattie’s granddaughter by Bertha Delma Williams Dutro, her daughter from her first marriage. Bertha Dutro lived until 1963, and had two more daughters. 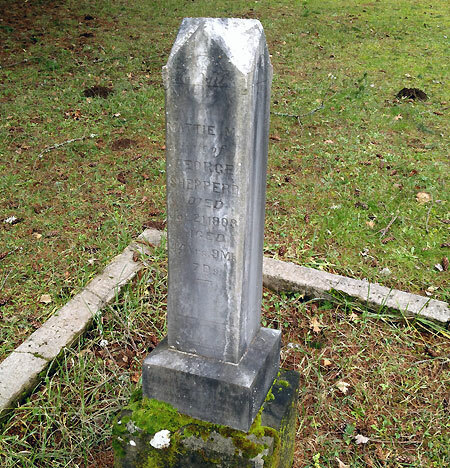 She is buried at the Idlewildle Cemetery in Hood River. 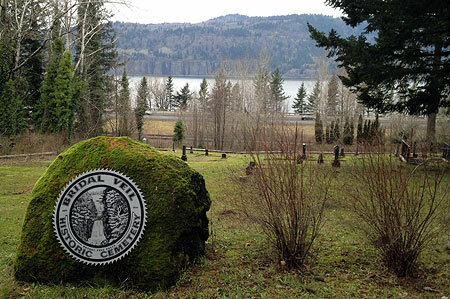 The tiny Bridal Veil Cemetery is still maintained and open to the public, though a bit hard to locate: an obscure gravel driveway drops off the north shoulder of the I-84 access road at Bridal Veil, just below the Historic Columbia River Highway. A number of early settlers from the area are buried in this lonely window into the past. 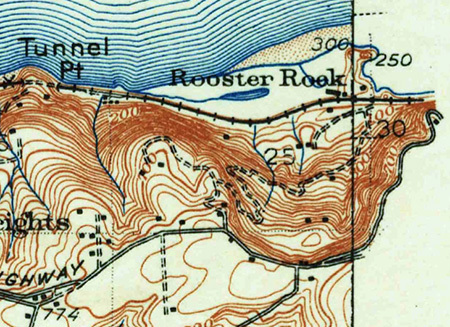 Over the next few years, George Shepperd must have met Samuel Lancaster as the engineer began his surveys of a possible highway route through the Gorge. Travel in the Gorge at that time was mostly by train, and the Shepperd farm was one of the many stops along the route. No record of their meeting exists, but George was described as an early supporter of the highway, and this is surely the time when he realized that he could be part of Lancaster’s grand vision. Some accounts suggest that the sudden loss of Mattie was also part of George Shepperd’s motivation to leave a lasting legacy with a land donation, but there is no record of this. 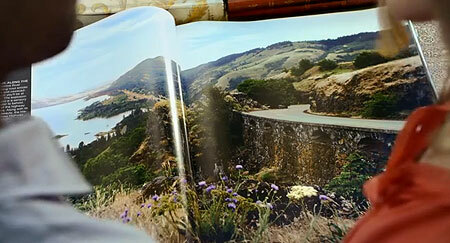 Instead, it was simply the beauty of Shepperd’s Dell that seemed to motivate him. Early 1930s postcard view of Shepperd’s Dell. Thankfully, Shepperd prevailed in the legal dispute. At that point in the dramatic early history of the new highway, the Shepperd’s Dell section of the road had already been constructed, but who knows what might have been built there had the land slipped away from public ownership? In November 1915, George Shepperd was fighting a second legal battle, joining the City of Portland in a lawsuit against the Bridal Veil Lumber Co., and their plan to divert Young Creek away from Shepperd’s Dell and into a generating facility to provide power for their mill. The City and Shepperd prevailed in this suit, as well. 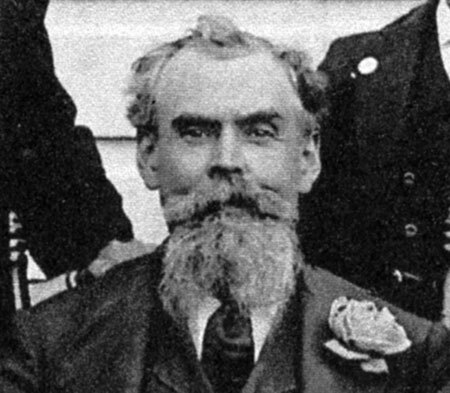 This is the only known photo of George Shepperd. It appeared in the Oregon Journal in 1915. 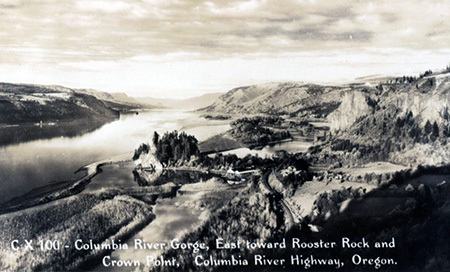 George Shepperd’s personal roller coaster continued on June 8, 1916, when he found himself seated among the most honored guests at the spectacular dedication of the Columbia River Highway at Crown Point. Shepperd was recognized in the formal program along with historical luminaries like Sam Hill, Samuel Lancaster, Julius Meier, Simon Benson and John B. Yeon. The ceremony was kicked off audaciously by President Woodrow Wilson unfurling an American Flag remotely by pressing a telegraph button in the White House, surely a highlight for a modest farmer from Canada. Mr. Shepperd’s donation is worthy of the highest praise, especially in view of the fact that he [is] not a wealthy man. He has made a sacrifice for the public good that ought to make some of our rich men ashamed of themselves. 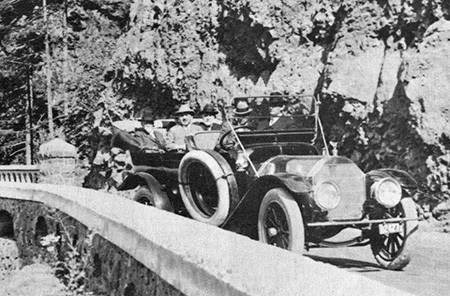 Close-up view of the vehicle carrying Sam Lancaster as he passed Shepperd’s Dell during the grand opening of the Columbia River Highway in June 1916. 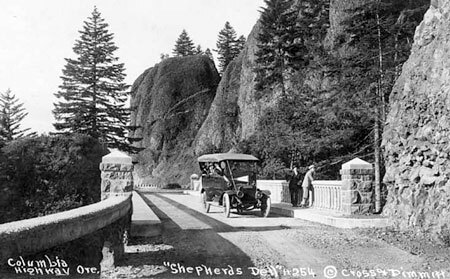 “One of the wonder spots on the Columbia Highway, in the daintiness and sublimity combined with its scenery is Shepperd’s Dell, which was donated to the highway as a public park by George Shepperd, because he loved the spot and because he wanted it preserved forever for the enjoyment of people who come along the highway. 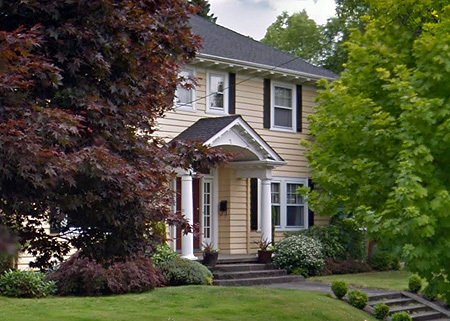 This home on NE Stanton Street in Portland is where George Shepperd lived out the final years of his life. By 1920s, George Shepperd had finally retired from his farm at Shepperd’s Dell, having survived his second wife Mattie and a remarkable series of peaks and valleys in his life. He moved to Portland, and lived there until passing away at his residence on NE Stanton Street in July 1930. George Shepperd’s modest grave marker at Riverview Cemetery. Shepperd left an estate of about $8,000 to his remaining sons and daughter, primarily property in the Shepperd’s Dell area. But he hadn’t forgotten his missing grandson Raymond, and left him a token “five dollars in cash”, (about $70 today) presumably in hopes that the execution of his estate might somehow reconnect Raymond with the Shepperd family. 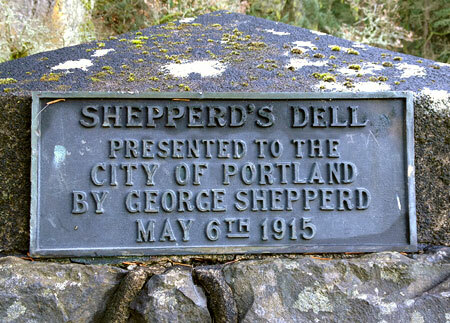 George Shepperd is interred at Portland’s Riverview Cemetery, along with many other important figures from the early period in Portland’s history. His understated gravesite is surprisingly distant from where his wife Mattie is buried in the Bridal Veil cemetery, and we can only guess as to why his surviving children didn’t bury him there. 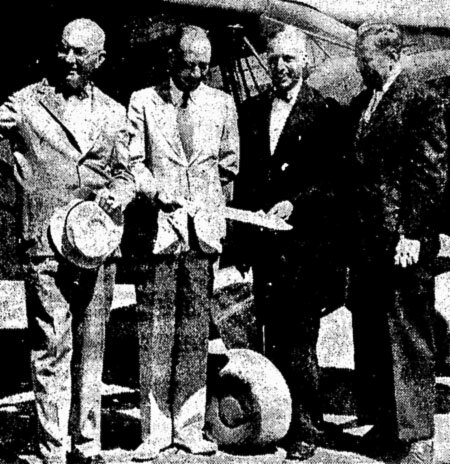 George Shepperd Jr. in an early 1940s news account, on the right. George’s children produced nineteen grandchildren, and the Shepperd family name lives on throughout the Pacific Northwest. His second-oldest son Stuart lived until 1952, when the Oregonian reported that an “elderly man” had collapsed on a sidewalk in downtown Portland, apparently from a heart attack. 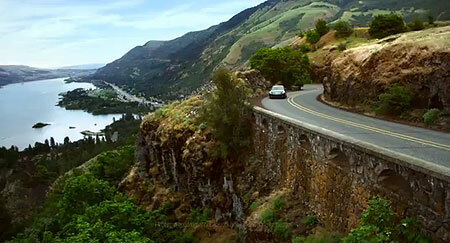 At the time of his death, Stuart Shepperd was residing in Latourell, near the family homestead in the Columbia Gorge. 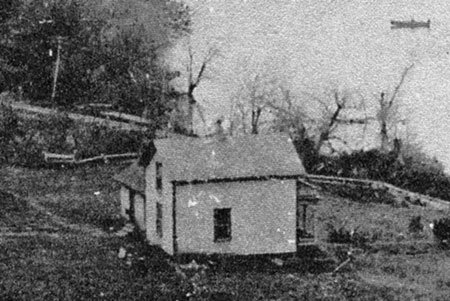 His surviving brother George G. was still living in Bridal Veil at the family homestead at that time. 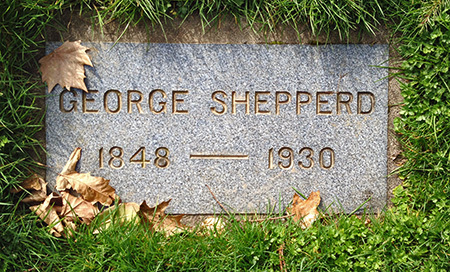 George G. Shepperd and his wife Emma left the Shepperd farm in 1953 or 1954 and George G. lived until 1961. George G Shepperd’s son George “Junior” went on to become a prominent officer for the Oregon Bank, and died in 1975. The youngest of George Shepperd’s four boys, John, died in 1959. Myra Shepperd, George’s only daughter and the only one of his children born in Oregon, lived until 1975. 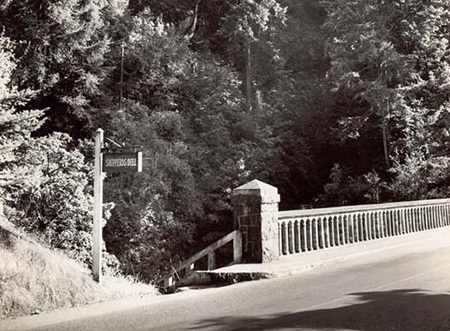 The bridge at Shepperd’s Dell in the 1940s, complete with a white highway sign from that era. 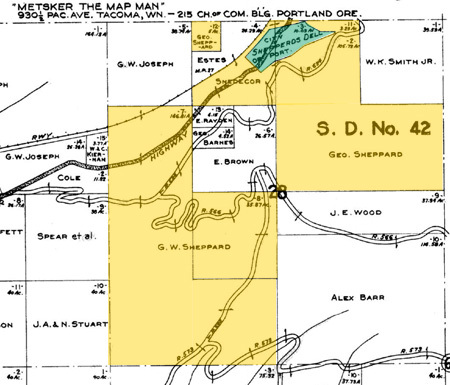 The original 10-acre Shepperd’s Dell park was transferred from the City of Portland to the Oregon State Park system in September 1940. The state made a series of additional purchases to expand the park over the next several decades, bringing the total size of today’s park to more than 500 acres. 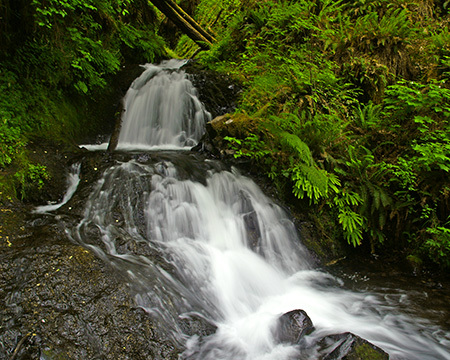 Today, Shepperd’s Dell State Park encompasses Bridal Veil Falls, Coopey Falls and the west slope of Angels Rest, to the east, in addition to its namesake waterfall grotto. George Shepperd’s legacy… and ours? Shepperd’s Dell lights up with fall colors each autumn. 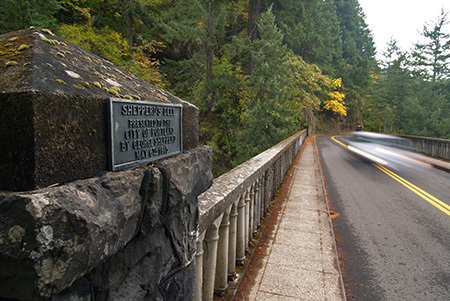 Imagine the Columbia River Highway without Shepperd’s Dell, and you can truly appreciate the magnitude of George Shepperd’s generosity and vision. There’s an important lesson from his legacy: bringing land into public ownership is complicated, expensive and often messy, and thus requires great determination. 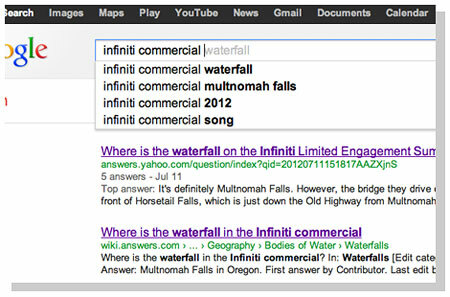 Flash forward to our times, and consider the hundreds of private holdings that still remain in the Columbia River Gorge. Then imagine the “good that men can do” (in Samuel Lancaster’s words) — what if just a few of these parcels were donated to the public in perpetuity in our time? 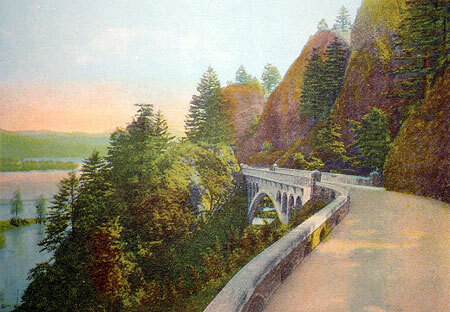 This unusual hand-colored photo from the 1920s is from the Bishops Cap, looking west toward the bridge at Shepperd’s Dell. Though the trees have grown, much of the rest of this scene is preserved today. 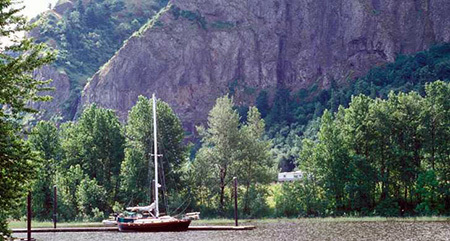 • The Friends of the Columbia River Gorge have become the most active in recent years in securing critical private holdings in the Gorge. 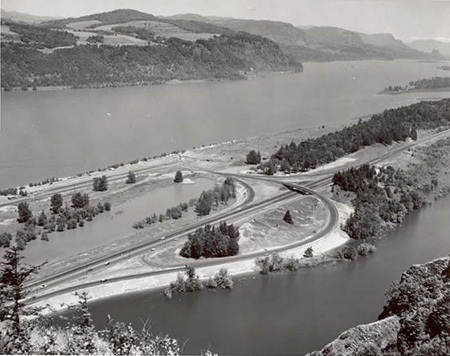 Without Friends of the Gorge, we would not have secured lands at Cape Horn, Mosier Plateau of the Lyle Cherry Orchard, for example, among more than a dozen sites acquired by the Friends. • The Trust for Public Land serves as a critical go-between in helping secure private lands for eventual public purchase. 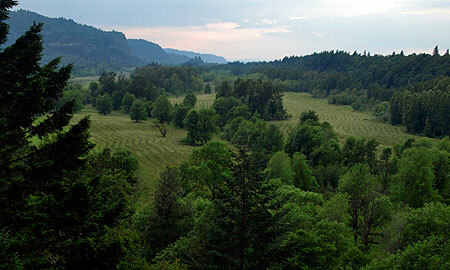 Without the Trust, we would not have secured nearly 17,000 acres in the Gorge through more than sixty separate transactions over the past 30 years. 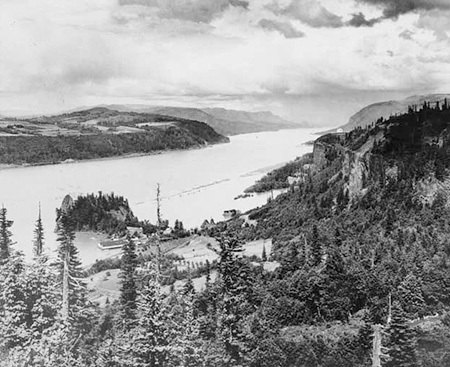 • The Nature Conservancy continues to acquire endangered ecosystems, and their extensive holdings at Rowena Plateau and McCall Point also serve as some of the most visited recreation trails in the Gorge. • The Columbia Land Trust is another important player in securing private lands in the Gorge, as well as the rest of the lower Columbia River. Their focus is on riparian sites and securing critical habitat. Very few of us will ever find ourselves in the position of George Shepperd, with a waterfall or craggy viewpoint to give to the public, but we can be part of that enlightened tradition in a smaller way. Please consider supporting these organizations in their efforts to expand our public lands in the Gorge! GEORGE SHEPPERD was a poor man but he gave all that he had. Without intending it he made for him a memorial that will for all time identify his name with unselfish public service. 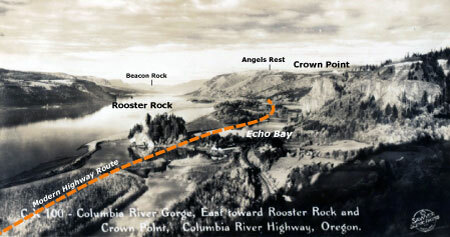 He owned a few rocky acres in the Gorge of the Columbia. It was land from which a living could be wrested only by dint of much toil. But through it ran a small stream that at last leaped and laughed and spiraled its way down through the great basaltic cliff that was the wall of the gorge. The course of the cataract led to Shepperd’s Dell. It was for many years George Shepperd’s habit to go on Sunday afternoon with the children and sit beneath a tree and look down upon the exquisitely fashioned spot. The harsh outlines of the rock, cast up aeons ago by volcanic fires, were softened and carved into fantastic and beautiful forms by the streamlet. Maidenhair fern clung precariously to the cliff. Flowers bloomed under the shadow of the tall and somber firs. 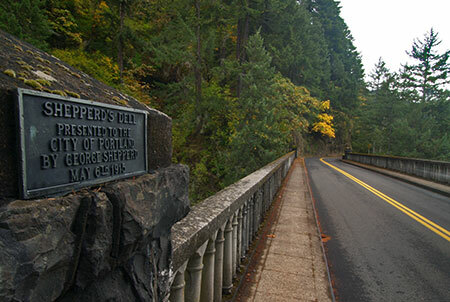 When the Columbia River Highway was built George Shepperd gave Shepperd’s Dell to the people as their beauty spot forever. At other points along the highway “No Trespass” signs appeared where property was privately owned. George Shepperd left a welcome. One wonders if there will be a bright Sunday afternoon when the spirit of this humble man will be allowed to return and brood over Shepperd’s Dell and share in the pleasure of the many who revel there. Having little, he gave all, and it became much. Acknowledgements: as you might have guessed from the length, this was among the more challenging articles to research for this blog, as very little is written about George Shepperd. An especially big big thank-you goes to Scott Daniels, reference librarian at the Oregon Historical Society, who helped me locate the only known biography of George Shepperd. The obscure Shepperd biography was written in 1997 by Muriel Thompson, a great-great niece of George Shepperd. Thompson traveled to Oregon to conduct some of her in-depth research, including court records from the various legal actions Shepperd was party to and digging into Oregon Journal archives at a time when news searches meant poring over microfiche archives. It’s an invaluable account of George Shepperd’s life and legacy. The stairs leading into Shepperd’s Dell from the bridge as they appeared in the 1940s – the signpost no longer exists, though the rest of the scene is largely unchanged. Thompson’s biography did not have the benefit of today’s internet research tools, and through a variety of these sources, I was able to piece together a fuller picture of George Shepperd’s complex life than was possible in 1997, especially details about his two marriages and additional historic news accounts about his land donation and the construction of the Columbia River Highway. There is still plenty of mystery surrounding this important player in the history of the Columbia Gorge: did any structures from George Shepperd’s farm survive? Why did his children bury him at Riverview Cemetery instead of Bridal Veil, by his beloved Mattie? What became of his grandson Raymond, by his vanished eldest son William? As always, I welcome any new or corrected information, and especially contact with any of his descendents. One of the unexpected joys in writing this blog is the opportunity to connect directly with grandchildren and great-grandchildren of important people in our regional history!